Jorge Escobar: [throwing down photo] This guy is perfect. His name is Tim Kearney, three-time loser from Palm Dale. Tad Gruzsa: Definitely a resemblance. Family? Jorge Escobar: Mom's dead, dad split. Tad Gruzsa: Uncles, aunts, brothers, sister? Jorge Escobar: Tim's an only child. On his own since he was 15. I saw this movie last night at a special screening for audience feedback. 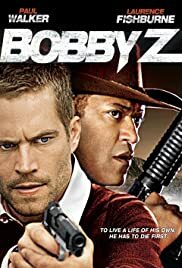 Paul Walker really can act - I was pleasantly surprised. I originally thought he was only cast for his looks, but can see he has good acting abilities. Movie was funny, worked well and I enjoyed it. The action scene in the kitchen was great and intense, kept me on the edge of my seat. Lawrence Fishburn - as always - great! He's a solid actor and his role as the DEA Agent worked perfectly. Paul's pretty love interest (Olivia Wilde from the OC)chemistry was lacking. Chuck Liddell, although was only in the beginning of the movie was convincing. There was also a girl named Ashley who I would have like to see more of. She's hot! The kid looks like he'll have a career ahead of him. The relationship between the kid and Paul Walker worked well and was believable. Not sure where I've seen him before, but he may have a promising career. I liked the sequence of the movie - it starts with a mystery and the flashback kept me trying to figure out what was going to happen next. I liked the movie can't wait to see on see it on the big screen. Hope if comes out soon. 71 of 107 people found this review helpful. Was this review helpful to you?